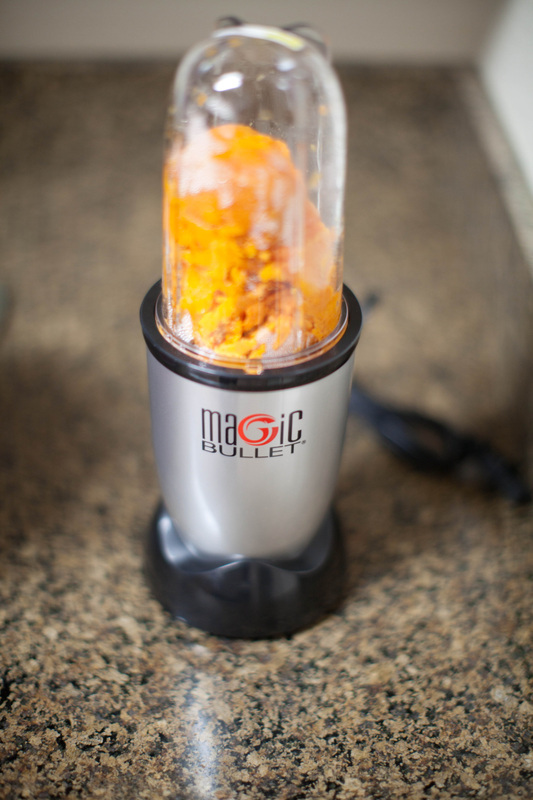 I'm the only person I know who could manage to break a Magic Bullet blender while preparing homemade baby food. Yes, I did this. Not to mention my kitchen looked like a bomb hit it by the time I was finished. I spent all day slaving away over a hot stove washing, chopping, peeling, scrubbing, blending, washing, steaming, stirring, washing, roasting, sweating, pureeing, mashing, and more washing. The end result? 12 small jars of homemade baby food. (Insert sarcastic eye roll here). And, of course, I can now proudly brag to all my friends that, yes, I make Molly's food from scratch. I'm a true, all-natural Chico mama! Um, worth it? I suppose. Yet, there's no shame in admitting that--after today's fiasco--I will definitely be buying the store-bought, baby food brands every once in awhile. ...then blended them with some breast milk and water. I really did end up breaking my Magic Bullet (long story and don't feel like explaining the details...let's just say the motor was "submerged" and I should have read the instructions...mommy brain!). I had to pull out my old blender which I think worked just as well. Molly's gramma and grampa gave me these jelly jars which are the perfect size for storing baby food. I ended up with 3 each of carrots, zucchini, apple, and yams which I put in the freezer. I've tried the store-bought stuff and this homemade puree is sooooooo much better tasting! As my Nonna would have said, "Mangia, Molly!"